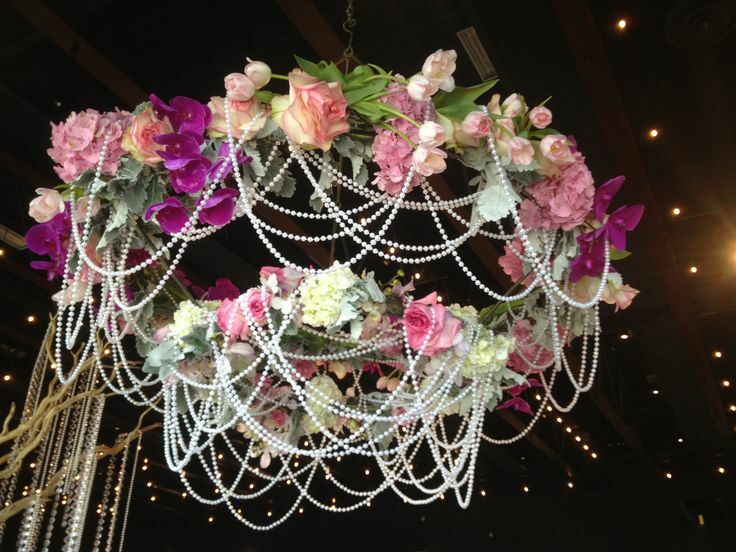 Need a gorgeous decor idea for your wedding or special event? Don’t forget to look up! The lighting and ceiling space in the venue can be an amazing spot to add floral touches that will take your wedding decor to the next level. Check out these awesome ideas for how to incorporate one of any wedding’s best accessories: Flowers, flowers, and more flowers! This hanging lantern style chandelier was totally transformed (and improved) by the addition of a generous assortment of gorgeous fresh flowers and greenery. Flowers included roses, garden roses, stephanotis, anenomes, and lisianthus in tones of pink, peach, cream and white. The cord was covered with white ribbon to further enhance the romantic effect. This beautiful vintage chandelier was hung outdoors at the Four Seasons Austin, and beautifully adorned with romantic flowers such as hydrangeas and spray roses. And you don’t have to be limited to only chandeliers! Get creative with ways to enhance the visual space using other objects. A clever idea is to hang multiple terracotta (or whatever style suits you) pots filled with beautiful flowers to suit your theme and wedding palette. This creative DIY idea uses a hanging mesh frame to suspend an assortment of beautiful blooms such as roses, carnations, ranunculus, daisies or peonies. Want to know how to make this? Check out the easy DIY Instructions. 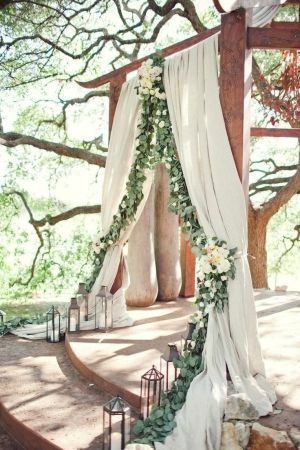 A bridcage suspended from a pretty ribbon makes another sweet and romantic visual to fill space in a high pergola or trellis. Depending on the season, you could use lilacs, lilies, lavender roses, stephanotis or white agapanthus to provide this charming effect. Get creative! You can adorn almost anything with beautiful flowers, either by pinning, taping, gluing or wiring them into place. You could also drape a pretty floral garland over a suspended light to add an instant “wedding” effect to an otherwise dull everyday object. Check out all the amazing deals on bulk flowers available at BunchesDirect and see how affordable it can be to create your own suspended floral masterpiece! One of the most dramatic and moving moments during any wedding will come with the bride’s grand entrance. Guests stand, happy expectation fills the air, and all eyes turn to the bride who then makes her walk down the wedding aisle. The aisle sets the scene for this magical moment, before, during and after the vows are spoken. Make sure your wedding aisle looks its best with fresh flowers and romantic accents that suit your theme and set the right mood. There are plenty of DIY ideas whether your wedding is indoors or out to help you create a wonderful setting for every budget: bulk flowers and rose petals can be your new best friends! Rose Petals: Buy rose petals in bulk from an online supplier like BunchesDirect, which come in bags of approximately 400 gorgeous petals, in a wide variety of colors. If you are patient and enjoy details (or have friends/family who can help) then you can create a stunning accent for your aisle by setting out beautiful patterns using a stencil or your own creative vision. Consider monograms, spirals, or other decorative patterns for huge wow factor. If you are perhaps not quite so detail-oriented (or don’t have the time or patience) you can also use varied shades of massed rose petals to give your aisle a gorgeous boost and help define it. 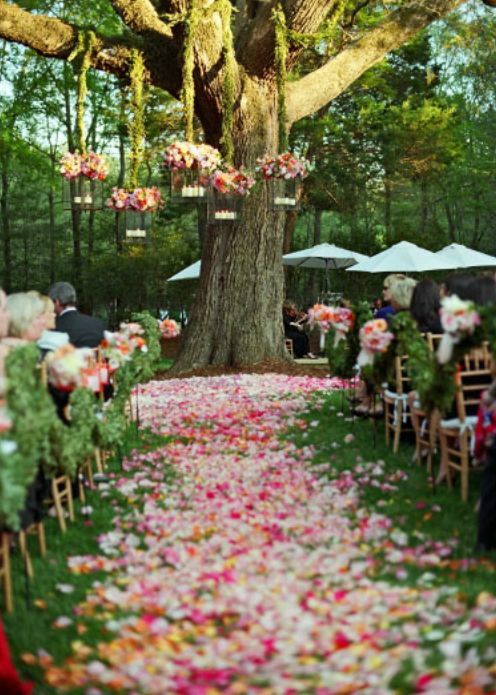 Another easy way to create beautiful impact using rose petals is to place generous handfuls of them spaced intermittently down the aisle, tucked in by the chairs and accented with lanterns and candles. Chair Accents: Hang flowers from the chairs to create a wonderful border for your aisle. Hang vases, mason jars, small burlap wrapped jars, or other containers from the chairs using ribbon or twine. Place fresh bulk flower bouquets, or bulk baby’s breath inside for a simple but gorgeous accent. Create a border: Set decorative accents along the aisle to frame it off and give it more impact. Purchase a few shepherd’s hooks from your local garden center and use them to hang vases, bouquets, or balls of flowers to help frame the edge of your outdoor wedding aisle. Making decorative floral balls (sometimes called floral pomanders or “kissing balls”) using craft store balls and bulk flowers such as carnations, roses, daisies, ranunculus or other flowers is an easy DIY project. Hang the pomanders from the chairs using pretty ribbon and you have an instant aisle accent. Check out our How-To blog for more info! 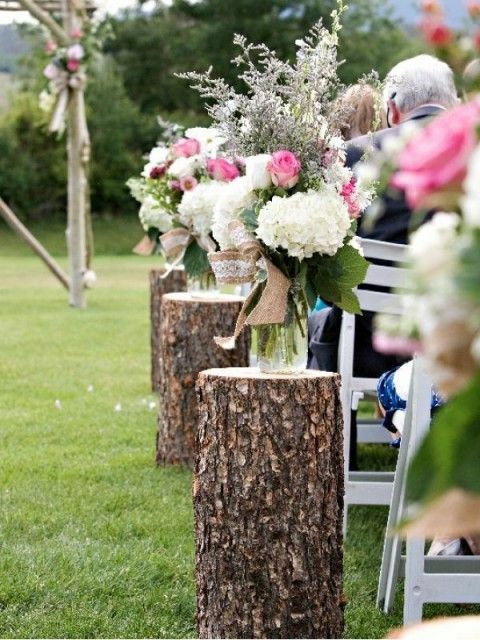 A creative idea to border the aisle at an outdoor wedding: use stumps to hold vases of flowers set alongside the seating. Use budget-friendly vases and create your own bouquets using a variety of fresh bulk flowers such as hyrdrangeas, roses, larkspur, baby’s breath, peonies, ranunculus, dahlias, daisies, or any of your favorite blooms. Use buckets for a cute “country wedding” accent, filled with baby’s breath. Use garlands and pearls to create a beautiful aisle border and dress with fresh flowers, such a pink spray roses, white lilies, or ranunculus for a more feminine and romantic feel. 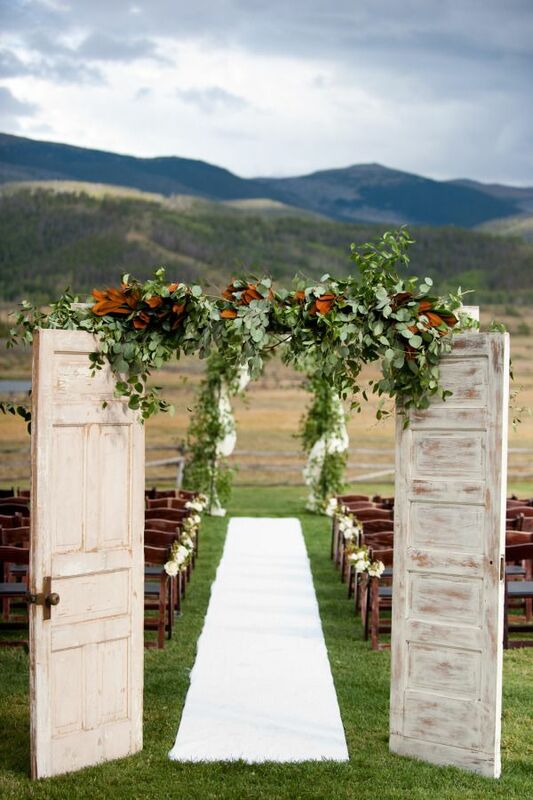 The Grand Entrance Consider using old doors to make an amazing “entrance” to your outdoor aisle. The Main Event: Set off the end of the aisle and the area where the vows will take place with a beautiful floral arch, garlands of flowers and greenery, curtains, special lighting or other detailed accents. Whatever your theme or budget, taking a little extra time to think about your wedding aisle will have huge impact on your final day. Don’t be afraid to get creative and to include accents that are meaningful to you. With a bit of planning and effort, you can take your wedding aisle from blah to beautiful, for a walk that you and your guests will never forget. Well, it’s time for another BunchesDirect Real Wedding! This month we feature the beautiful wedding of Becky and Cameron, who married on a warm Saturday in August 2014. For their wedding, the couple went with a “country rustic” theme that is popular with many brides today (including Kelly Clarkson and Miranda Lambert). Becky and Cam’s wedding is also a great example of some inspiring DIY wedding tips that show how much you can do yourself, for awesome results at big savings. Becky & Cam married just outside Ottawa, Canada with approximately 150 friends and family in attendance. The entire wedding party (bride included) sported cowboy boots. The five bridesmaids wore amazing blush peach dresses with irregular ruffled hemlines. The ladies incorporated crown braids into their hairstyles, Becky included, for a beautiful, romantic look (Ashley Tisdale’s bridesmaids wore similar hairstyles in September). Cam and the groomsmen wore a handsome modern county combo of dark blue denim, white shirts, brown ties and brown vests (similar to country superstar Blake Shelton’s wedding day look). The wedding flowers were custom created by Bunches Direct (www.bunchesdirect.ca), in a classic but natural look that would be in keeping with the country theme. Becky supplied some burlap that she wanted tied around all the bouquets to finish them off with a more “rustic” effect. For the bridal bouquet, Becky requested white hydrangeas, a few light pink roses and some baby’s breath scattered through the bouquet to match the bridesmaids’ bouquets. A bit more greenery was added to round out the look; salal leaf was chosen because it is similar to the hydrangea leaves. 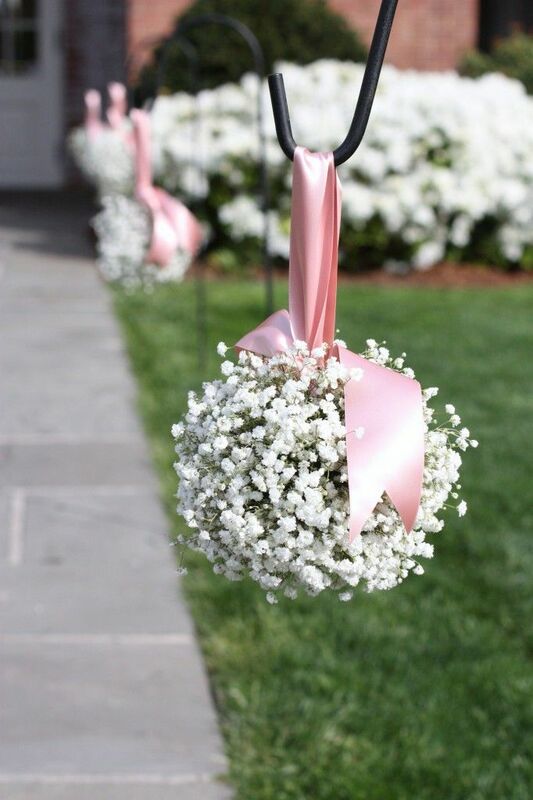 For the bridesmaid bouquets, Becky wanted clusters of baby’s breath to keep things simple. A little less than a full bunch of baby’s breath was needed for each bouquet, finished off with burlap around the stems. The boutonnieres for the groomsmen were done up with little clusters of baby’s breath and a touch of greenery. Again, this provided a very natural look and a bit of twine was tied around the stems to coordinate with the burlap. It’s a good idea to make the groom stand out a little while still coordinating with the wedding party, so his boutonniere was done up in a light pink rose (to match the bridal bouquet) with some baby’s breath, greenery and twine added to match the groomsmen. Becky and Cam bought bulk flowers and created their own centerpieces with the help of friends and family. To do this they purchased 80 pink mini carnations, 9 bunches of babys breath and 75 light pink roses. They used mason jars and painted white wine bottles wrapped with burlap and lace as the flower vases—what an awesome country look. This is a fantastic way to save on your wedding flowers and as you can see, you can still achieve a gorgeous result! Becky also made these decorative letters herself by wrapping twine around the forms—another very creative DIY project! The wedding included a photo booth, with fun props and accessories that Becky and Cam put together from the local Dollar and craft store. Obviously, this was a hit with the guests! Another awesome DIY creation was this beautiful wooden wedding sign, which Becky made using peel and stick letters (amazing!). Mason jars were provided for glasses, along with this cute idea to allow guests to customize (and thereby identify) their glass for use during the reception. Family and friends enjoyed a fun party at the local Canoe Club with great food and great company. The bouquet toss was another popular event of the evening. Congratulations to Becky and Cam! Not only did you have a lovely wedding, you did it on a fantastic budget, and it’s obvious that you found a lot of joy in each other. Thank you for sharing your special day with us. We wish you years of health and happiness!